Back in September 2018, the University of Nottingham was proud to be awarded both International and Sports University of the Year for 2019 in the Times and Sunday Times Good University Guide of the Year. In this series of written pieces, we will seek to focus on the different areas of our sporting offer that contributed to this success, and helped to put the University of Nottingham on the map for sporting excellence in the UK. To kick things off, our first area of focus will be our world class sporting facilities that underpin everything we seek to do. We have 3 sport and fitness facilities at the campuses of Sutton Bonington, Jubilee and University Park, ensuring that our offer reaches every corner of the University community and sport is accessible for all regardless of the course studied or the department staff work in. We also have excellent grounds available at Highfields with 11 pitches for both Rugby and Football as well as a soon to be opened purpose built beach volleyball court. 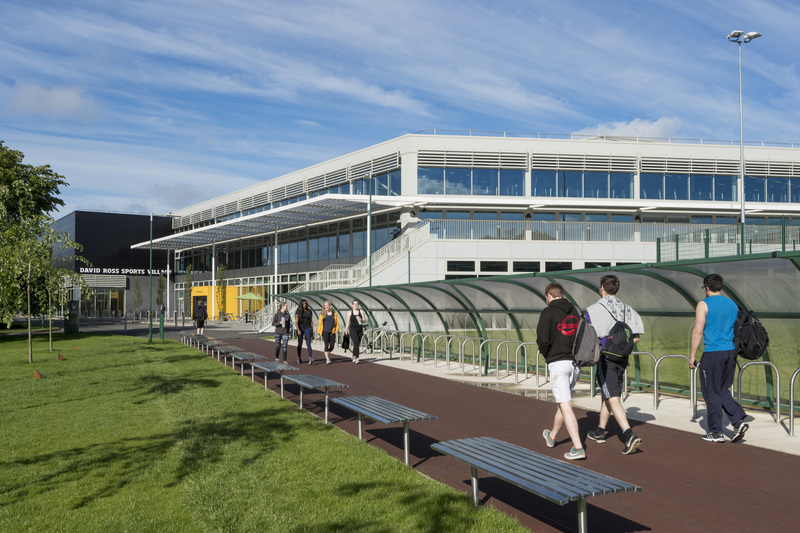 This is supplemented by the Riverside Sports Complex which plays host to many Intramural Sport fixtures each and every week during term time. And with close partnerships with Nottingham Hockey Centre and Nottingham Tennis Centre on the southern side of University Boulevard, ensuring our athletes have the very best facilities available to them, regardless of their sport. The David Ross Sports Village broke ground in early 2015, with the demolition of the old sports centre on the same site. With 15 months in a temporary facility to the south side of the new development, the wait was well and truly worth it when the new building was opened to the campus community and public in October 2016. Before it’s official opening in May 2017 by Olympic table tennis champion Dr Deng Yaping, gold medal-winning canoeists, Dr Tim Brabants MBE and Etienne Stott MBE and UK Sport CEO, Liz Nicholl. Speaking at the time, Director of Sport, Dan Tilley summarised what the development meant to the organisation. The state-of-the-art £40 million facility was only possible as a result of the generosity of Carphone Warehouse founder and Law alumnus, David Ross who contributed a large gift towards the project, with the project also receiving additional contributions from alumni through the Impact Campaign. We got a lot facility for that £40 million with a venue that has transformed our outlook and ambitions in all aspects of our sporting strategy. Here are just some of the highlights of the facility. 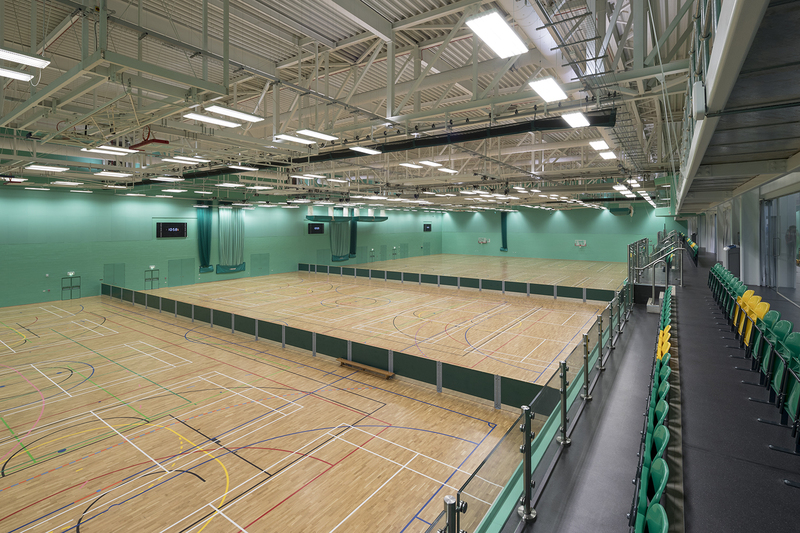 The showpiece 3,840m2 sports hall, split into 4 smaller halls offers a variety of configurations including up to 20 badminton courts; 4 netball courts; 4 volleyball courts; 4 basketball courts; 4 handball courts; 4 indoor hockey pitches; 2 korfball pitches; 4 futsal pitches. 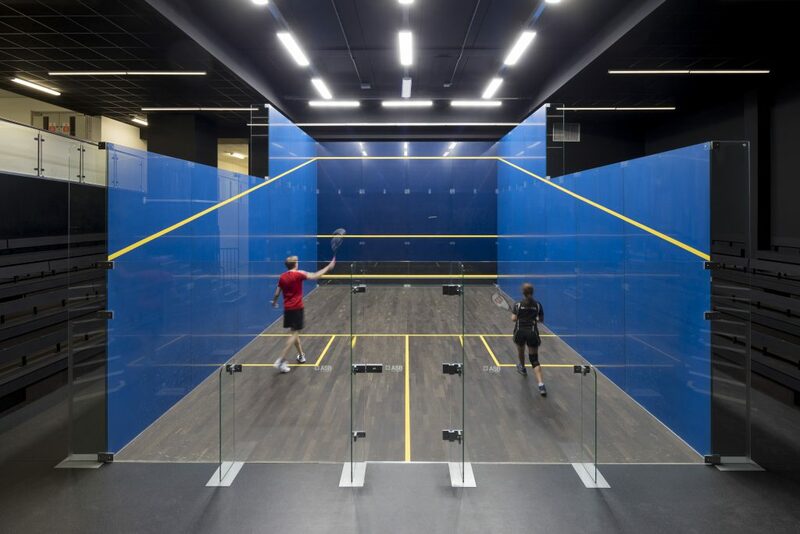 There are 6 glass fronted squash courts, with a unique all glass squash show court which has played host to Premier League Squash (PSL) fixtures and national squash championship matches, giving spectators a special view of each game in the purpose built arena. 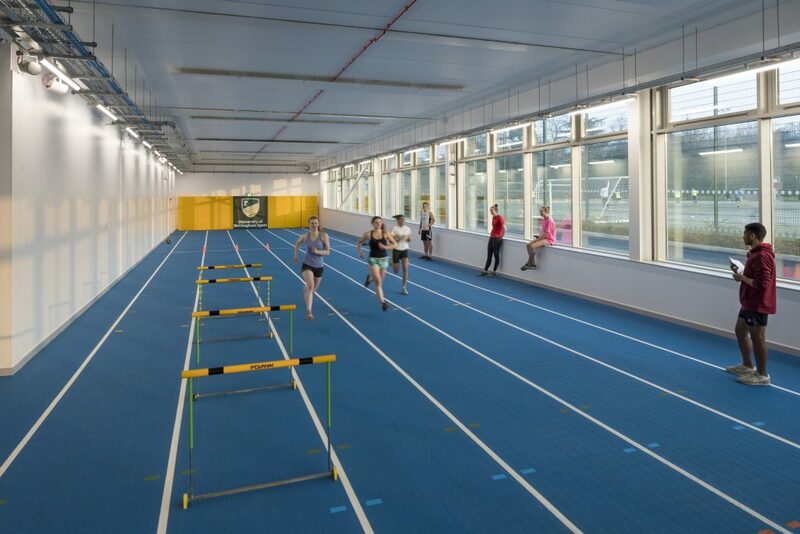 Our strength and conditioning suite which includes an 80m sprint track occupies the lower floor of the eastern side of the building. Now affectionately termed the High Performance Zone (HPZ), this area regularly hosts training for our sporting scholars as well as our performance first teams in the lead up to big fixtures. It also occasionally plays host to professional sporting professionals including local para-athlete Richard Whitehead MBE and teams, including most recently England’s Lionesses Football squad. The Sports Injury Clinic, with purpose built consultation, assessment and treatment rooms, as well as a dedicated hydrotherapy pool further highlights the commitment to seeking the highest standards in supporting elite sport. Open to both student athletes and member of the public, the Injury Clinic offers tailored support for a variety of conditions. As part of the 2015/16 developments, we were also able to link the DRSV to our pre-existing swim facility, which features a 25m x 18m pool. In the next few weeks, to further enhance our offer in this area, we will be opening our new premium Health & Wellbeing suite. Our fitness suite on the top floor of the building received the latest Life Fitness equipment when it was opened and now boasts over 200 stations to cope with the demand during peak times at the facility. We also have 2 large dance studios as well as a dedicated spin studio which all play host to around 20 fitness sessions each day. Finally, the 12m climbing and 3.5m bouldering walls which greet visitors when they enter the DRSV have enabled us to offer a new programme of climbing lessons and opportunities to encourage those to give the sport a try. Whilst giving those who are advanced climbers the opportunity to develop their skills and practice on the 40 different routes and problems available at any given time on each of the walls. This is just a snapshot of our world class sporting facilities that are available to students, staff, alumni and the local community at the University of Nottingham. You can view a full list of all our facilities on our website here.